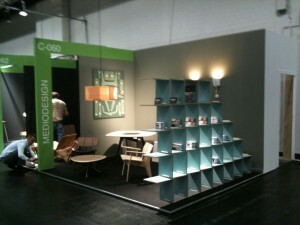 Last augustus 2010 we were together with Mediodesign discussing to apply for the exhibition programme D3 Design Talents at IMM Cologne. D3 professionals, a selection of emerging independent designers and design studios, was our target. After several emails exchanges, change of plans and yet another change of plan. Maria Téresa León and Juan Pablo Quintero finally could send the application just days before the deadline of october 30th 2010. The good thing about being that late is that waiting for the results of the application didn’t take that much. After a couple of weeks they received the official confirmation and invitation to the fair. Is Mediodesign an emerging design studio? We believe it is. It is equipped with talent, energy, strong professionalism and a good work ethic. Juan Pablo Quintero and María Teresa León have been around for several years under the name Mediodesign, working hard! On the other side, the commercial experience bundled in Arré agency is a good complement to these talents. Multilingual, commercial savvy, international, knowledge of logistics, finance, distribution, access to an international network of photographers, graphic designers, architects and retailers. In a sense, we want to participate at D3, but prepared on all fronts. At the design level, and at the commercial level. Prepared!